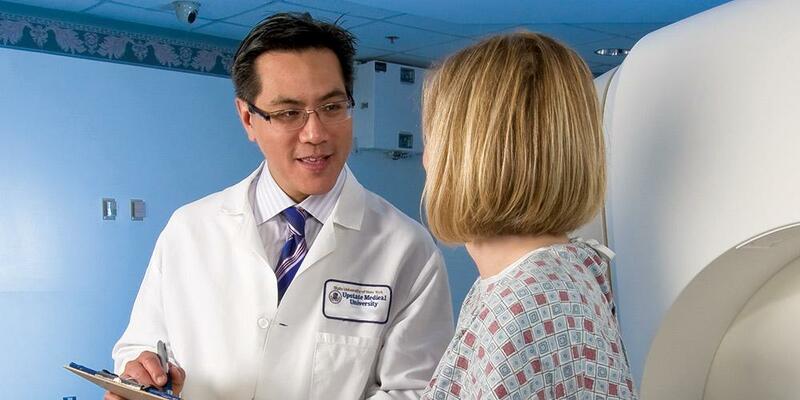 The Neuro Oncology Program encompasses the full range of modern neuro-oncologic treatment. The care and treatment of patients with primary central nervous system tumors is a collaborative effort by members of the departments of Neurosurgery, Neuroradiology, Neuropathology, Radiation Oncology, Medical Oncology and Pediatric Hematology-Oncology. MKM frameless stereotactic microscope and localizing system to map and plan tumor resections. The Department of Radiology provides state-of-the art CT and MRI imaging interpreted by board certified neuroradiologists, intraoperative ultrasound, angiography, and interventional procedures such as preoperative embolization of meningiomas. The Department of Pathology provides a full range of histologic and immunohistochemical analyses by board certified neuropathologists for the accurate diagnosis of primary central nervous sytem tumors, which is essential to guide further therapy. Radiation Oncology provides external beam radiotherapy using megavoltage linear accelerators, and, in collaboration with the Department of Neurosurgery, sterotatic linear radiosurgery and brachytherapy. The Departments of Medical Oncology and Pediatric Hematology-Oncology provide conventional adjuvant chemotherapy and supportive care in the outpatient and inpatient settings, as well as experimental Phase I, Phase II and Phase III chemotherapy protocols through in-house studies, the Buffalo-Rochester Syracuse Neurooncology Research Group, and the Pediatric Oncology Group. Active collaborative bench research involving members of the Departments of Neurosurgery, Medical Oncology, Pediatric Hematology-Oncology, Radiation Oncology, Neurology, and Neuropathology is ongoing and relies heavily on tumor tissue and cell lines derived from clinical specimens from patients. Current studies include mapping double minute chromosomes in gliomas, the role epidural growth factor receptor in glioma and modulation of amplification of the gene for the receptor as a target for therapy; the use of epidural growth factor receptor amplification as a prognostic factor for chemotherapy response, the use of amofistine as a radioprotectant in childhood brain tumors, and the role of interferon inducible genes in glioma. Last Modified: February 01, 2019. Contact Casaundra Hildreth with questions about the content of this page.